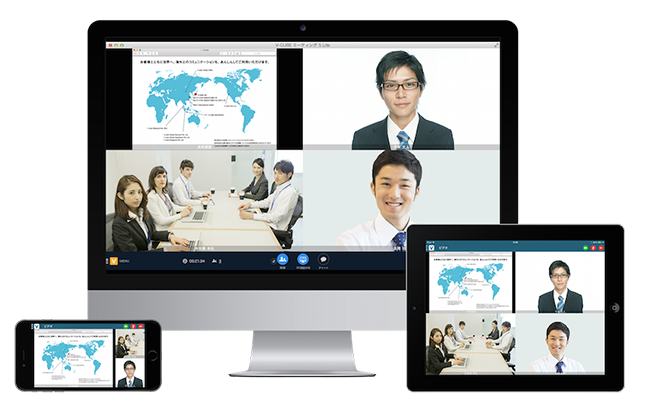 V-cube presents the latest in web conferencing services:V-CUBE Meeting | V-cube, Inc.
V-cube, Inc (HQ: Meguro-ku, Tokyo, President & CEO: Naoaki Mashita, hereon as V-cube) released the latest version of our cloud-based web conferencing service, V-CUBE Meeting, on Tuesday, 1 September 2015. This marks the first major version update of this service in nine years. The new V-CUBE Meeting incorporates the latest visual and audio technologies to bring to the world a video and sound quality that is on par with videoconferencing systems. A user-friendly interface that also works smoothly on smartphones and tablets, with stable connection for overseas communication, setup support and 24/7 helpline, among other amenities. The new and improved V-CUBE Meeting is a service that is safe and secure. Adopting the latest visual and audio technologies, web conferencing can now be held in HD sound and picture quality making it as good as a videoconferencing system. An interface that supports smartphones and tablets for those not in the office. With simplistic operation, it is easily usable to all. To support the growing trend of businesses turning global, a dedicated network environment has been built in to maintain strong connection for communicating overseas even in an environment where the network is less than stable. A support set-up that covers installation support as well as a 24/7 helpline, allowing subscribers to use the services without stress. A communication platform with tight security as desired by most businesses. Thus far, we have over 5000 subscribers comprising of corporations ranging from large to medium. V-cube is a visual communication service provider that connects different places visually and audibly so no one would have to travel in order to meet. Since its inception, V-cube has gained over 5000 corporate subscribers and garnered top shares within the domestic market (*) for eight consecutive years. Besides enabling parties in different locations to confer with one another, V-cube services also cover a wide range of areas of communication including internal training and education, as well as conducting sales with clients in remote locations. V-CUBE Meeting also serves to complement the flexible work styles people are increasingly turning towards. Designed to be used as infrastructure for providing a communication platform, real estate and medical industries adopted the system to provide online consultations and the education industry use it to provide online courses. V-cube provides visual communication services that cover all the bases of communication in the business environment in order to help bring about new and improved ways of working.